Dessie Smith Prescott, A Florida pioneer who was born in the backwoods of Alachua County. Left an orphan when her widowed mother died in the great flu epidemic of 1918, she supported herself from an early age by nontraditional ‘women’s work’ such as selling cars. She built her own home, a log cabin, at age 19. During World War II, Prescott served in the Women’s Army Corps. She was Florida’s first professional woman guide and the first female licensed pilot in the state. 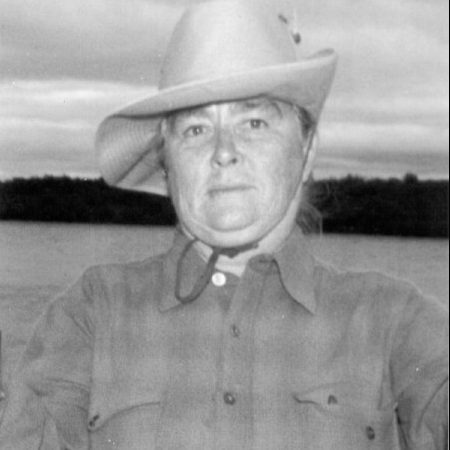 Her legendary knowledge of Florida’s natural resources and history are derived from a life of hunting and fishing. Prescott’s boat trip on the St. Johns River with Pulitzer Prize-winning author Marjorie Kinnan Rawlings was chronicled in the ‘Hyacinth Drift’ chapter of Rawlings’ Cross Creek.